Cats are drawn to the scents and textures of many household plants. Pets and plants aren't the most compatible roommates in the world. Cats often indulge in a few leaves or stems from local flora, leaving behind only remnants of a once verdant plant. It's not a one-sided relationship though, many common house plants pose a significant threat to your pet's health. Despite their beautiful and graceful blossoms, lilies are one of the worst house plants a cat owner can have. They are toxic to many animals and are particularly harmful for cats, according to the University of California. Practically every true lily species, which are collectively grouped under the genus Lilium, are a potential threat. This includes popular cultivars like Easter and Stargazer lilies. Some lily plants that are not classified under Lilium, also called "false" lilies, are also toxic to cats, so it is best to avoid all kinds of lilies altogether. Aloe vera is cultivated both domestically and commercially as a medicinal plant. It is also a viable potted plant for an indoor environment. While its healing properties are a great utility for humans, the plant itself is toxic to cats, dogs and some other animals. Cats that chew on the leaves or stem of an aloe plant may show severe symptoms of digestive distress, including vomiting or regurgitation, diarrhea and urine discoloration. Take your cat to a veterinarian as soon as possible if you think she consumed even a small portion of an aloe plant. While many gardeners grow their vegetables and fruit plants outdoors, away from the hungry eyes of resident felines, some of these plants are often cultivated in pots indoors in the off-season. Both garlic and onion plants can sicken cats if they eat any part of them. Mulch made from cocoa bean is toxic to dogs, but is not a known danger to cats, according to the University of Wisconsin. There are literally dozens of common houseplants that are harmful to cats, so it is always a good idea to contact a veterinarian or an animal hospital to ask about a particular species if you aren't completely sure. Some of the most dangerous ornamental houseplants include anemone, daffodil, chrysanthemum and asparagus fern. 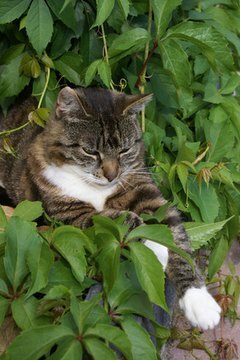 Consuming these plants may cause your cat to become lethargic or erratic. Monitor any sudden change in behavior closely. Some of the woody and larger herbaceous species are also toxic to cats, although these plants are less likely to be your pet's first target for consumption. Poison hemlock, Daphne and angel's trumpet are all potentially deadly for felines. Several yew species, including the yew and English yew, are toxic to cats, dogs and livestock. University of Wisconsin Extension: Common plants, what's poisonous and what's not?